Places have personalities. 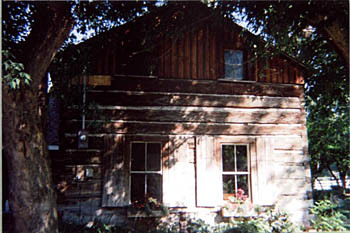 The old two-story log house on Barnhartvale Road in Kamloops is friendly. Friendly but reserved, as you might expect from a house which has been home to a prize-winning orchardist, three generations of a pioneer family, and an English remittance man, and which was probably a refuge for an accomplice of the notorious Billy Miner Gang. The house is set back from the road. Sheltered among cottonwood, maple, walnut and acacia trees, the house keeps its secrets. Its age is one of them. No one knows exactly when it was built; building permits not being required in the 1800’s. Speculation is that it was built in 1890. The Crown Grant of Land to Robert Pratt, a copy of which Gary and Lynda Kershaw, the current owners, have, shows that Mr. Pratt fulfilled his homestead requirements and received the land in 1896. Whatever the house’s age, it was built by expert craftsmen; though no one knows who they were, either. It’s made of hand-hewn pine logs, in dimensions we’ll never see again. There are eleven layers of them from the foundation to the eves. Each layer is one continuous log. 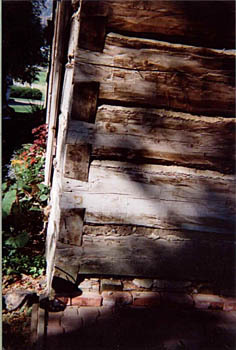 On the long side of the house the third log up is twenty-seven and a half feet long; on the short side, the third log up is twenty-one and a half feet long. The only breaks in these logs were cut to fit in two tall windows. The logs are fourteen inches thick and are carefully dove tailed together at the corners. No nails or spikes were used, just superb woodwork. A kitchen addition built soon after the original house is of hand-hewn logs like the big house. Probably it was built by the same skilled workmen. The logs are hand-surfaced with a broad axe. Other than that, they are not finished in any way. “People have wanted to redo the logs, but why would you want a hundred year old house to look sparkling new?” puzzles owner Gary Kershaw. Gary's father, Robert Kershaw, did a lot of broadaxing for railway ties. He’d logged at the coast trying to raise money to buy the ‘Pratt’ house. He appreciated the careful axe work. There’ve been several types of chinking. Originally the logs were chinked with a combination of local clay and sand, mixed with lime or lye, straw and horsehair. Builders used what was handy. The second chinking was done with mortar. Gaps in the mortar were replaced with concrete. The house is a work in progress. Right now it’s time to re-chink. “Depending on finances, we may use something close to the original mixture. We don’t want something that doesn’t suit the house.” Gary insists. The foundation was a mixture of concrete and rock. “Made by some Frenchman”, rumour has it. There weren’t many Frenchmen in Kamloops. Maybe this one worked in the fur trade at Fort Kamloops. There was a porch, but no attic. Inside walls were plastered. There were two bedrooms downstairs. Upstairs was divided into a boy’s section and a girl’s section, for the Pratt children. They needed the room. When Robert Pratt married Helena (Ellen) Todd in 1892, she was the twenty-four year old widow of Reignford Knapp and had three small children. Robert and Helena went on to have six children of their own. The old house must have resounded with children’s games and laughter. How did a respected family man, and prize-winning orchardist come to associate with an alleged horse thief and train robber? As they say, ‘you can pick your friends; family’s another matter.’ Helena’s sister Maggie Todd was the wife of Paul Stevens. Paul Stevens was a shady character who’d come to B.C. from Idaho, leaving, it was whispered, a wife and family behind. At his isolated cabin he raised a few stock, shot wild game and sold the meat in Kamloops. He was suspected of adding to his income by horse rustling. Stevens, related though he was by marriage to the reputable Todd and Pratt families, had some dubious associates. One was Billy Miner, a convicted stagecoach robber from the U.S. Released after a lengthy stay in San Quentin, Miner discovered stagecoaches were passé; trains were the popular mode of transport. Miner was willing to change with the times. He drifted into Canada, settled in the Kamloops area and began to study trains. On May 8. 1906, the C.P.R. train was robbed by three men at Duck’s Station, east of Kamloops. Misdirected by the mail car attendants, the three robbers escaped with only $l5.50 in cash and a bottle of catarrh medicine. Chagrined they rode back to their hideout. That is two of them did. ‘Interred With Their Bones’, Peter Grauer’s history of Billy Miner in Canada, provides compelling circumstantial evidence that Paul Stevens was that third train robber. He had recently purchased a large order of groceries and paid in cash, suspicious, since Stevens never had much cash. The morning of the robbery he was seen leading three horses corresponding to the descriptions of the robber’s horses. After that it’s no wonder law enforcement wanted a long talk with Stevens. He was arrested but released for lack of solid evidence. His fellow robbers, Billy Miner and Shorty Dunn, were found guilty and sent to the B.C. Penitentiary. They never divulged the name of the ‘third man’. Paul Stevens and Margaret Todd lived together until both died in 1950. It can’t have been an easy life. A letter from Margaret recovered by the Kershaws during renovations to the house asks Robert and Helena for ten dollars. Margaret’s Todd and Pratt relatives stayed loyal to her. That irrigation project was essential for residents of Barnhartvale. Without water land there is fairly barren. With water settlers could grow crops, gardens, orchards, and hay fields. They could feed their families, their animals and sell extra produce. The next owner, who definitely had his secrets, was a colourful personage. Hubert William Heaton Willes, “Cappy” as he was always known, owned the farm from 1923 to 1947. Gossip said that Cappy was an English remittance man, someone whose well to do family paid his expenses to live in the colonies, provided he not return home. It seems certain that Cappy was from a lofty family. He had attended Winchester College, an elite boy’s school founded in 1382. The 1891 English census lists numerous servants as well as family members in the family home in Sussex. 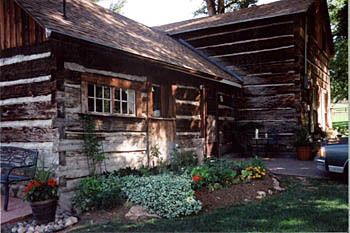 Cappy was married; his wife and daughter visited him in the Barnhartvale log home, though neither seems to have lived there. Neighbours regarded Cappy’s wife as ‘a very grand lady’ and said that his daughter, Phyllis, ‘gave herself airs’. “Cappy was a kind, friendly and eccentric man”, Gary Kershaw notes. He was generally liked. Cappy , proud of his military experience, was very involved with the 31st Regiment British Columbia Horse (militia). Dogs and horses seem to have been his strong suit, farming not so much. He’d likely not been raised to understand farming so he neglected the farm and the house. He seems to have abandoned other ‘civilized’ behaviour. “He was disheveled in dress and generally very dirty”, writes Gary Kershaw. His appearance did not prevent him from greeting visiting dignitaries. Conscious of his rightful place in society he would join other local notables on the welcoming committee no matter how strongly they might wish he wouldn’t. Cappy was sixty-two in 1947 when he moved into Kamloops where he lived for another twenty-two years. Canada seems to have agreed with him. He sold the house to the Kershaws. A new era in its history was about to begin.